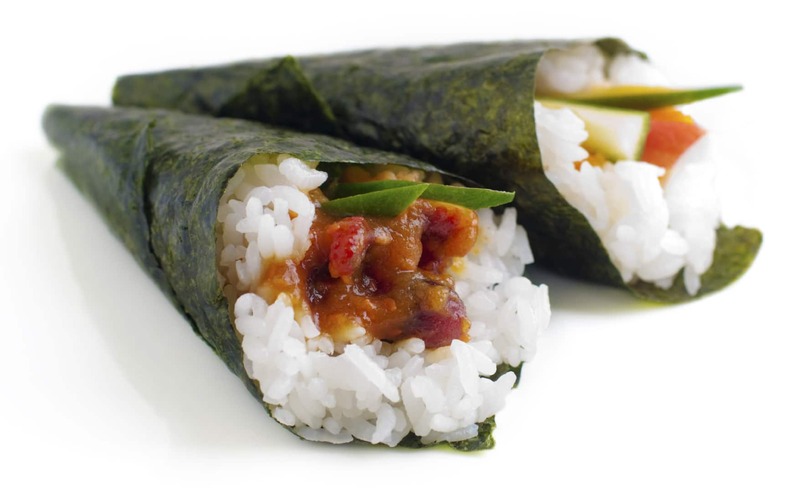 One of the easiest styles of sushi to make is called temaki sushi, otherwise known as the hand roll. It is easy to hold, difficult for the contents to spill while eating, and can be exquisite looking when filled with a variety of ingredients. To start, take a piece of nori and cut it in half. Place a small handful of rice on one side of the sheet and spread it out a but, being careful to not go all the way to the edges. Place your fillings on top using whatever you want, the sky is the limit, but don’t pile them too high. When all of your ingredients are in place, you will roll the nori into a cone by taking the bottom corner where you placed the ingredients and rolling the sheet over in an arc. It is easier than it sounds. The cone can then be sealed with a little moisture from the rice, condensation from your glass, or not even sealed if you intend to eat it right away.